DIY Lemon and Sugar Scrub, $2 Dollar Tree Recipe! Some people think that in order to save you have to sacrifice on your beauty regimen. NOT TRUE! 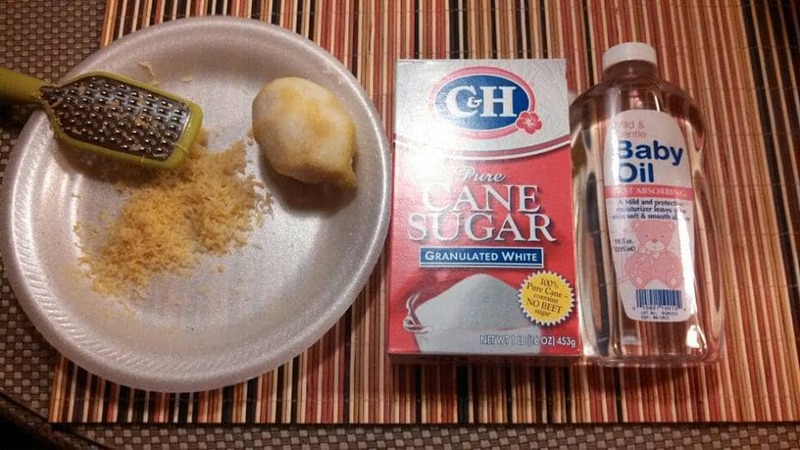 We can use ingredients found at home or at the dollar stores to whip up some awesome stuff to keep us looking our best! Since it is summer and we all have exposed skin, this time around I’ve been concentrating on scrubs to keep our skin soft and touchable. I tried a salt scrub and now I’ve moved on to sugar. Again, you might already have this at home so you won’t have to spend anything but if you don’t you can go to your local Dollar Tree store and pick up sugar and baby oil. We use the 2:1 ratio and we are ready to mix this up! Now you can use any oil. I wanted to try baby oil because a lot of us are moms and have this usually in our homes. I also wanted to try it because of its already light texture and fresh scent. I took one large lemon and grated to get all the zest and then I squeezed the juice. Depending on how strong you like the smell of lemon you might want to add more zest or more juice. I stayed with one as my lemon was very potent. 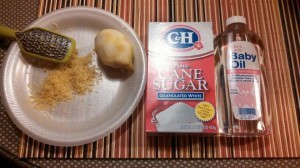 You mix your sugar and oil first, and then gradually fold in the zest and add the lemon juice. Mix until well blended. I scrubbed my elbow as a test. Aside from my feet this is my driest and roughest part of my little old body. My elbows are happy campers tonight! This did a great job at helping the roughness. 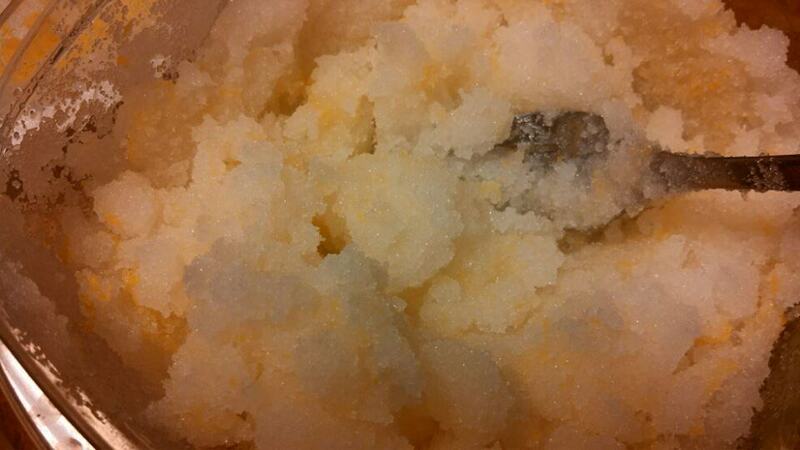 As with the Sea Salt scrub, I only spent $2 on ingredients as I had a lemon on hand. If you do not have a lemon, how about an orange or a grapefruit? I can’t wait to try out other citrus blends. 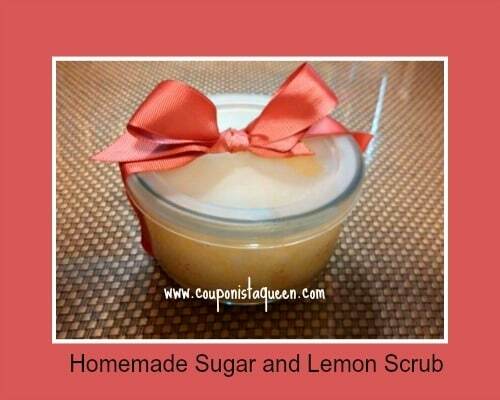 You will have a nice scrub to use or gift for 13 cents an ounce as opposed to 63 cents an ounce if you buy a 16 oz jar at $10. You can also use any container to put it in, so save a nice jar or two. 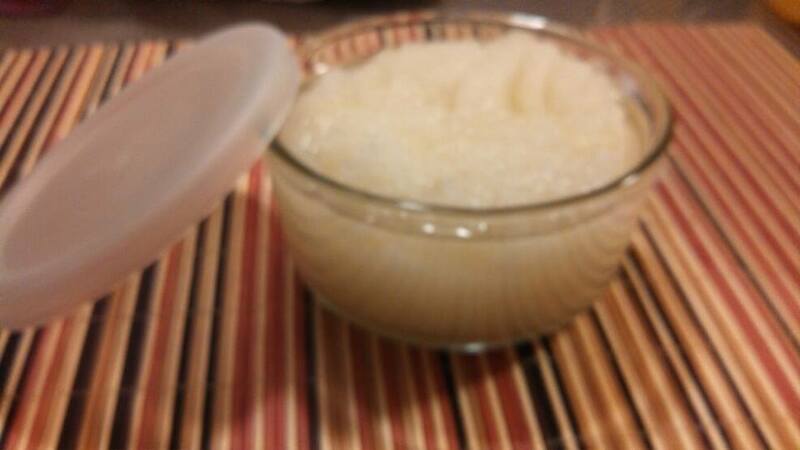 If you are keep it for yourself a Tupperware works, an old mason jar, the possibilities are what is in your cupboard. Just make sure that the container is not porous or the oil will seep out. I love making these so much I’m going to make some for gifts soon. Next up on my DIY list?? I’m not sure, so please leave us some comments for what you’d like us to whip up for our Beauty on a Budget posts.